Unique Solutions, Inc – RV Product Group’s mission is to develop and market innovative, unique solutions that enhance the RV ownership experience, with a focus on ecology & conservation. Unique Solutions, Inc, (USI) was incorporated in 1987 to focus on statistical methods for quality. The company's focus was training and consulting in Total Quality Management methods and tools, including team-building and statistical methods, such as Statistical Process Control (SPC), Design of Experiments (DOE) and Measurement System Methods/Analysis (MSMA). Unique Solution Inc’s target market was major automobile manufacturers and suppliers. The consultants leveraged the depth of TQM knowledge, unique training methods pioneered by USI, and standard TQM tools to drive innovative solutions to the Fortune 100 in the automobile industry. Their success quickly spread, and soon USI was also sought after by the medical industry. USI consultants hold numerous patents in the areas of alloy development, mechanical components design, manufacturing processing, ceramics, ceramic reinforced composite applications, and more. Most of these inventions were the result of using DOE applications to specific automotive needs. In the fall of 2008 USI expanded their focus to include innovative and unique products for the Recreational Vehicle market. 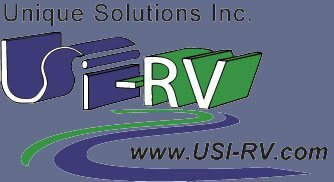 With the addition of the RV-Products group, USI has a focused commitment to bring to the market time-proven solutions and innovations, that are engineered, tested, field-proven, and, above all, enhancing to your RV enjoyment. Unique Solutions, Inc – RV Products Group is run by the next generation within the USI family. The president of this group is a veteran of RV-ing for more than 30 years. He has a technology engineering degree, spent nearly three decades designing & implementing innovative systems for Fortune 500 companies, and also ran a kitchen & bath products manufacturing company. His entrepreneurial spirit, coupled with his passion for RV-ing, has led him and his team to develop innovative, practical, green fixes for the challenges and needs of RV-ers.